Discount Tire Centers understands that buying tires can be confusing. We want your tire-buying experience to be as simple as possible - some of the terms and numbers have been described here to assist you. The Service Description on a tire generally follows the Tire Size Code. It typically consists of a 2-digit number and a letter. 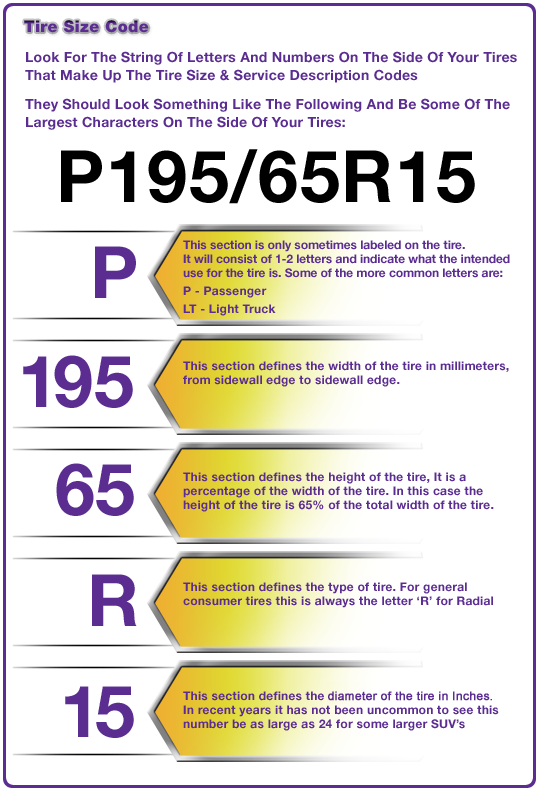 The letter defines the Speed Rating of the tire. This indicates the maximum speed the tires can sustain for a 10 minute endurance during testing. Below are some of the more common ratings. As you may notice there is much more information on the side of your tire. If you would like to learn more, our professional staff would be more than happy to explain all the facets of the terms and codes on the side of your tires. Give us a call or just stop by your local shop with any questions you may have.